The monetary policy of the major central banks is the topmost factor that moves the Forex market. Monetary policy is, in turn, most influenced by inflation. To give an example: if money supply M is growing at a rate of 10% per year and the economy T is growing at 3% per year, in order for the equation to balance, the price level P must go up. If the price level is going up, that is inflation. This is why we continue to watch money supply data from the major central banks, even though other factors have assumed importance in recent years. Two cases illustrate that while the equation of exchange is a tautology, it does not explain everything. In the early years of the European Central Bank, for example, ECB reported money supply M rising at quite high rates like 7-9% for months on end and yet worries about inflation were subdued. This was because wage levels were being held down, at least in the key economy, Germany. The P as price level refers to the prices of goods and services, of which wages are a large contributing factor. When the Federal Reserve began quantitative easing in 2008 by buying US Treasuries for cash, it was delivering that cash to the banks, which normally would be expected to lend it out. But the banks failed to lend it out and instead turned around and kept it in interest-bearing deposits at the Fed. So while money supply M was indeed going up and by a huge amount, V or velocity of money was zero or negative, and thus there were no price pressures on the real economy side of the equation. It is absolutely amazing how many analysts and commentators got this wrong because they neglected to consider velocity. You can see it on the figure below from the St. Louis Fed, which publishes splendid data and charts on monetary data. Whenever you see a questionable assertion on the basis of US monetary policy, the St. Louis Fed website is the best place to go find out for yourself if an analyst is blowing smoke. 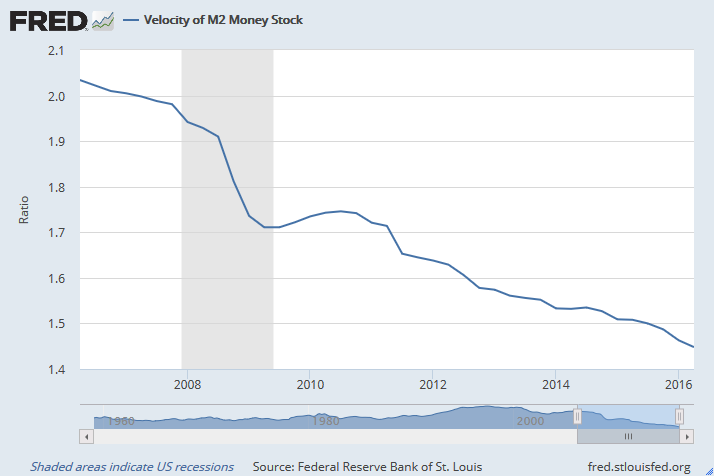 Velocity of M2 Money Stock from 2006 through 2016. Source: Federal Reserve Bank of St. Louis. As discussed in the lesson on factors affecting currency rates, inflation counts because if the cost structure in one country becomes more expensive than in a trading partner country, the expensive country will find it can no longer export to the trading partner — its goods are priced out of that market. In order to restore trade competitiveness, it must cut costs by finding cheaper raw materials, cutting wages — or devaluing the currency. Finding cheaper raw materials or some other cost advantage is supposed to have been a primary motive behind colonialism and various land grabs over the centuries. Now that this route to a cost advantage has been closed, the one thing a government can do to manage its economy is to manage inflation. Unless it wants to impose wage and price controls, monetary policy is the tool. Governments need to manage the economy to a certain extent in even the freest of free market economies because not doing so can have dire consequences — those damaged by inflation may reach for their pitchforks and boot the government out. If you are a saver and have accumulated a pot of rainy-day and old-age money, inflation eats away at your purchasing power. Merchants will hoard goods that will cost more in the near future, causing shortages. The German hyperinflation of 1921-1924 is widely thought to have created the popular discontent that led to the rise of the Nazis, along with a kickback against the insult to national pride of the World War I reparations demand (coupled with a bankrupt government). As with many other economic data releases, inflation has its biggest effect in the form of expectations rather than the reported number itself, or rather the discrepancy between the expected data and the actual. If inflation has been running on the low side of the central banks’ desired range, and suddenly a fat rise in inflation comes along, the central banks will be assumed to be in a hawkish mood. An expected rise in interest rates often has the effect of lifting the currency, at least temporarily. All currencies are influenced by expectations about the next central bank policy decision and those decisions are considered to be based chiefly on the inflation outlook. Forex analysts will also watch something called the output gap. This refers to unused capacity, which is most measurable in manufacturing and other industrial applications (like mining, electricity production, and so on). This may seem not to pertain to monetary policy, but go back to the Fisher equation — on the right-hand side of the equation is T, or what we call GDP today. If producers were working at optimum capacity, they would produce 100 units — but today they are producing only 70 units. The missing 30 units are the output gap, and inflation tends not to occur when the output gap is big (operating at only 70% of capacity is big). Case in point: when big Australian natural resource companies announced they were cutting capital investment in mining (in 2013) because of an expected drop in demand from China and other emerging markets, the Australian dollar fell in anticipation of a rate cut. This had nothing to do with inflation and everything to do with an expected increase in the output gap. You need to grasp the Taylor rule to grasp the main job of a central bank, which is to keep the economy on a growth path that is non-inflationary. Managing inflation is the explicit mandate of the European Central Bank, whereas the Federal Reserve has a second chore — to keep unemployment from getting too high. The Taylor rule blends both inflation expectations and the output gap. John Taylor is a Stanford University economist who devised the rule in 1993, and it was embraced far and wide. The Taylor rule states that central banks make the most effective policy when they raise or lower short-term interest rates when inflation is rising too fast or output growth endangers closing the output gap. The unemployment rate is used as a proxy for the output gap. Optimum monetary policy should thus be to raise rates by more than inflation is expected to rise. By now there is more than one Taylor rule as theoreticians pile on additional factors, but the core principle is the same — it is the job of monetary policy to contain inflation without strangling growth. The Taylor rule does not address the question of the level of the exchange rate, but Forex traders are quick to see where any discrepancies may lie. To follow through on the example of the Australian dollar mentioned above, for about a year following the initial shock of the lowered capital spending plans by mining companies, which implies a rise in unused capacity, one of the most important factors driving the AUD was employment. When employment came in abnormally low, or at least lower than expected, the AUD would fall on talk of a rate cut. When it started coming in stronger than expected, the AUD rose — because the output gap must be narrowing and thus a rate hike might be possible. Notice that it was not wages, the real inflationary factor, that was being followed — but the proxy for the output gap. This is the way something that does not look like monetary policy at a first glance can be seen to be an authentic monetary policy component. 1. Monetary policy concerns which two factors the most? 2. Quantitative easing is a way to increase money supply and is inherently inflationary. 3. The primary goal of every central bank is to prevent high inflation. 4. Expectations about inflation are more important than inflation itself.